Number 3 and 4 lands clean. marks still visible. Silver trunnion bearing shows Valve deck illustrates cleanli- normal wear of lead flashing. ness typical of both engines. 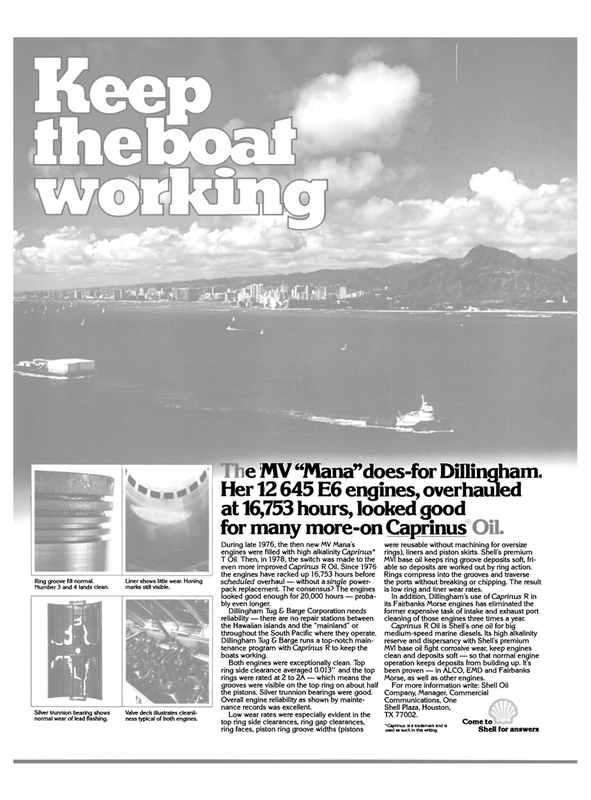 e MV "Mana"does-for Dillingham. T Oil. Then, in 1978, the switch was made to the even more improved Caprinus R Oil. Since 1976 the engines have racked up 16,753 hours before scheduled overhaul — without a single power- pack replacement. The consensus? The engines looked good enough for 20,000 hours — proba- bly even longer. Dillingham Tug & Barge Corporation needs reliability — there are no repair stations between the Hawaiian islands and the "mainland" or throughout the South Pacific where they operate. Dillingham Tug & Barge runs a top-notch main- tenance program with Caprinus R to keep the boats working. Both engines were exceptionally clean. Top ring side clearance averaged 0.013" and the top rings were rated at 2 to 2A — which means the grooves were visible on the top ring on about half the pistons. Silver trunnion bearings were good. Overall engine reliability as shown by mainte- nance records was excellent. MVI base oil keeps ring groove deposits soft, fri- able so deposits are worked out by ring action. Rings compress into the grooves and traverse the ports without breaking or chipping. The result is low ring and liner wear rates. In addition, Dillingham's use of Caprinus R in its Fairbanks Morse engines has eliminated the former expensive task of intake and exhaust port cleaning of those engines three times a year. Morse, as well as other engines.